Who doesn’t like chipotle spices? Who doesn’t like maple butter? So why not combine them, right? sweet potatoes, brussels sprouts and extra firm crispy tofu to produce a savory-hot-sweet taste. What was interesting is that I started out to make a Southwestern-flavored dish and had the tofu cut and marinating, but then stumbled upon a maple-glazed brussels sprouts recipe at Good Life Eats (http://www.goodlifeeats.com ). It’s got some but not all of my ingredients, for instance I added the tofu and the smoked paprika to make it a main dish, not a side dish. So the final dish is one tasty vegan feast. Prep the tofu, brussels sprouts and sweet potatoes per the ingredients list above. Mix tofu marinade and pour into a shallow pan. Lay the tofu in the marinade and gently turn to coat. Set aside. Mix the brussels sprouts/sweet potato marinade. Toss the sweet potatoes briefly in the marinade and remove back to their bowl. 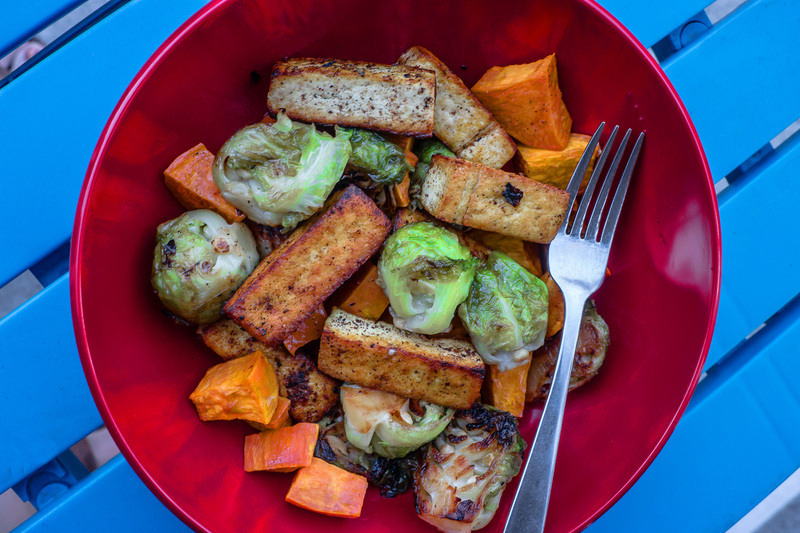 Now if you want, you can put the sweet potatoes, brussels sprouts and tofu on a cookie sheet and roast them for about 20 minutes in a hot oven. Test with a fork every 10 minutes or so to make sure the vegetables and tofu don’t burn. Some things will be ready sooner than others so be prepared to babysit the oven. Bring oil back to high heat and fry the sweet potatoes. Don’t turn them until you start to see a little bit of burn on the bottoms, then turn them all over once. When golden on both sides, drain on paper towels. Now get that heat up again, add a little more oil if necessary, and fry the tofu strips til they are crispy on the outside. Do not move them around until the bottom is browned. Flip over just once. Drain on paper towels. Now mix all the reserved marinades — chipotle and maple butter — together so they co-mingle in one small bowl. To assembly everything, put the tofu, brussels sprouts, and sweet potatoes together in a clean wok and heat to sizzling. Add salt and pepper to taste. Pour on the reserved marinade, toss a bit, and serve.